At NY Party Works, we have helped plan every type of party you can think of and probably more than a few types of parties you’ve never thought of. After all, we’ve been in the party planning business since 1993. There are often very obvious reasons to celebrate like birthdays, sweet sixteens, Bar or Bat Mitzvahs, anniversaries or graduations. But sometimes your company wants to create an event or you just simply want to have a fun party. If you’re having a party, “just because,” one way to make it memorable and enjoyable is to create a themed party. We do all types of these events at NY Party Works and we want to share with you some of our top ideas for party themes. It’s summertime and we’ve reached the part of the year where your company’s culture may be changing a bit. A lot of companies have reduced hours in the summertime, usually on Friday. Others will relax corporate dress codes. Companies acknowledge that employees want to feel more relaxed at a time when colleagues are sometimes on vacation and the kids are home from school. That’s why summer is an excellent time to hold your company picnic. 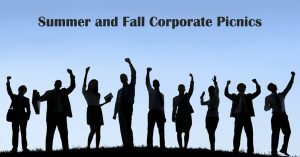 Corporate picnics are a great way for a company to gather their employees and show their appreciation. Picnics can take place from early spring all the way into the fall. 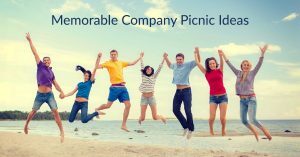 Many companies will hold their picnics on work days and have their employees leave work early as a bonus. Tents, tables, chairs and entertainment can be set up right on the company grounds. This is a great way to get your employees to socialize on a different level. Another popular idea is to invite your employees’ families to the event. Once again you can set up on company grounds if space allows. If not, many corporations will hold their party at a State park or private grounds. 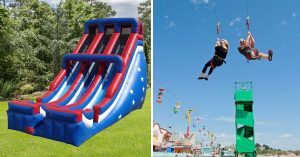 NY Party Works has rental items and event planning services that will make your corporate picnic a huge success. Summer hasn’t officially started yet and we’ve already seen some hot weather. The temperature’s going to rise some more, so why not have a hot summer party that will also cool your guests down. 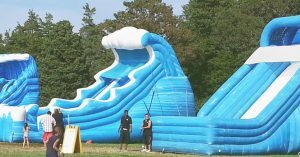 NY Party Works has the spectacular party rentals you need for any occasion and we know that nothing is a bigger hit for summer fun than water activities. The poem “Mending Wall” by the great 20th Century poet Robert Frost famously ends with the line, “Good fences make good neighbors,” but NY Party Works would like to respectfully disagree. We know that great parties make great neighbors. 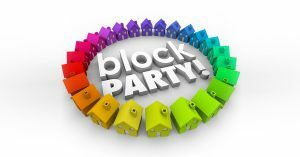 That’s why block parties are so popular. They’re a great way to bring your neighborhood closer together and in many areas, they are a beloved annual tradition. The end of the school year is almost upon us and if you’re affiliated with a summer camp, you know that your busy season will be coming faster than you know. There’s a lot to prepare for, such as camp programs, outings, and events. There’s one event that’s always a highlight of the season. It’s the annual camp carnival and it’s a chance for campers to play games, win prizes and burn energy. Go ahead and say it: “No more pencils, no more books….” It’s the end of the school year and students deserve a celebration after a long year of studying. That’s why you see so many end-of-school-year events. The last day of school means it’s time to relax and it is time to celebrate. And NY Party Works can help you plan your end of school year event. It’s a hot time to have a hot party. 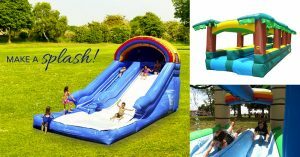 As the weather gets warmer, why not change your “indoor” party or event to an outdoor celebration? 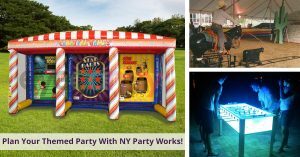 If you’re looking to host a unique event, let NY Party Works show you how. We’ve been in the party and event rental business since 1993, but we’re so much more. 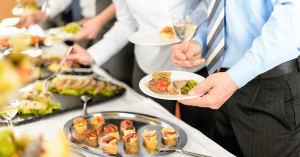 NY Party Works has helped our customers plan all types of events from corporate gatherings to personal celebrations. 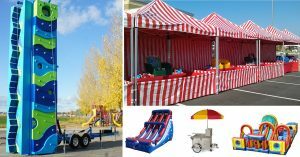 And we have the products and services to make your outdoor party be the hit of the season! Worried about rain? Don’t be. 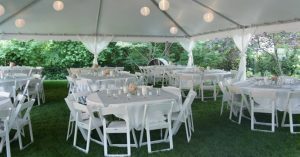 NY Party Works can rent you tents to keep you covered if the skies darken. Let us tell you about our private party packages. The most important resource your company has are your employees. The people who work for you or your organization are the ones who achieve the goals your business sets out to meet. They bring their hard work, creativity and passion to your organization and they deserve the appreciation of their co-workers and their employers. And employees notice. According to the Charlotte Observer, appreciation ranks among the most important factors for workplace satisfaction, in an annual survey conducted by Workplace Dynamics.